North Eastern Space Applications Centre (NESAC) has been providing thunderstorm nowcasting (forecasting up to 4 hours) services for North Eastern Region (NER) of India since 2015 under the North Eastern Regional node for Disaster Risk Reduction (NER-DRR) initiatives. This was done using the data from satellite imager and sounder onboard INSAT-3D / INSAT-3DR, automatic weather station data, and by analysing numerical weather forecast data. However, it was difficult to detect, track and forecast using this data alone as most of the thunderstorms being a localised event, extending only over a few tens of km and having a lifetime of less than one hour. The availability of DWR data has opened a new window for precise identification of thunderstorm weather systems, track them and forecast the probable areas which may get affected, albeit with lesser lead time. 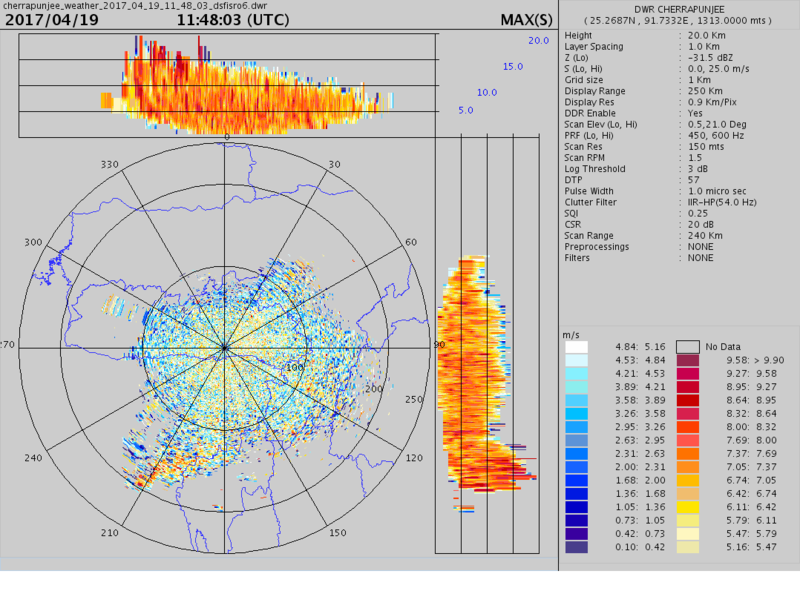 The first S-band dual-polarimetric Doppler Weather Radar (DWR) was installed at Cherrapunjee, Meghalaya which was dedicated to the nation by Shri Narendra Modi, Hon’ble Prime Minister of India on May 27, 2016. NESAC is operating the DWR continuously since then, and the data is made available in near real-time for the public through the MOSDAC (Meteorological and Oceanographic data archival centre) and IMD websites. The DWR is calibrated at regular intervals and the data and products are being validated. It has unobstructed coverage for the entire state of Meghalaya, Tripura, Southern Assam, and part of Mizoram and Manipur. For the western and central Assam region, the DWR has coverage beyond 3-degree elevation only. The DWR also sees a large part of India’s neighbouring country, Bangladesh. The radar completes one volume scan in 11 minutes, comprising of 360-degree azimuth scan for 10 elevation angles ranging from 0.5 to 21 degrees. It also allows sector scan (in both azimuth and elevation) for high temporal observation of any event. The DWR covers a distance of 250 km (up to 500 km only for Z) with a spatial resolution of 300 m.
A thunderstorm is a pre-monsoon season (April-May) phenomenon over the NER of India. The data collected by the DWR during 2016 was used to understand the thunderstorm and storm signatures and calibrate the nowcasting model. During 2017 the nowcasting service was made operational. 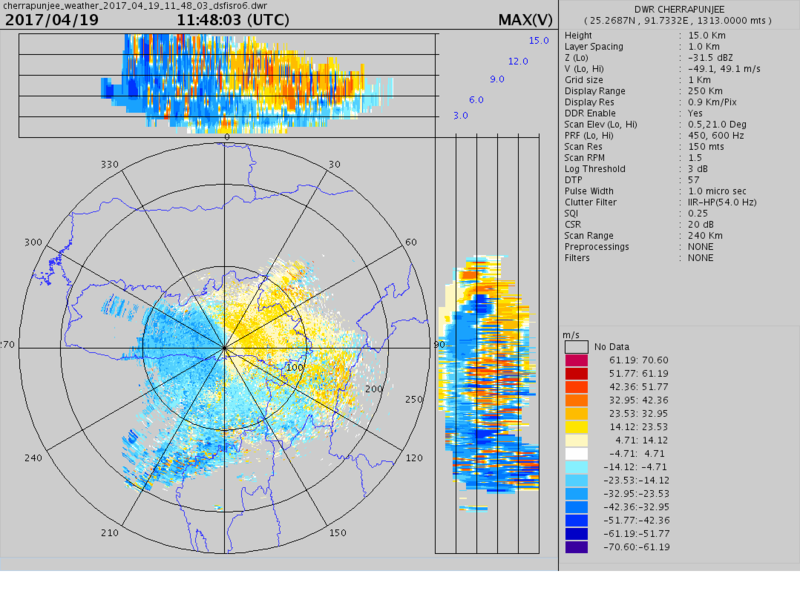 Severe thunderstorm nowcasting services for Southern Assam, Meghalaya, and Tripura were done primarily using the DWR data and for the rest of the NER, the earlier methodology was used. In addition to the Z (radar reflectivity), S (spectral width) and V (velocity) data collected by the DWR, extensive use of the polarimetric data like ZDR (differential reflectivity) and ρHV (Correlation coefficient) were also made to differentiate thunderstorm clouds from non-thunderstorm clouds. 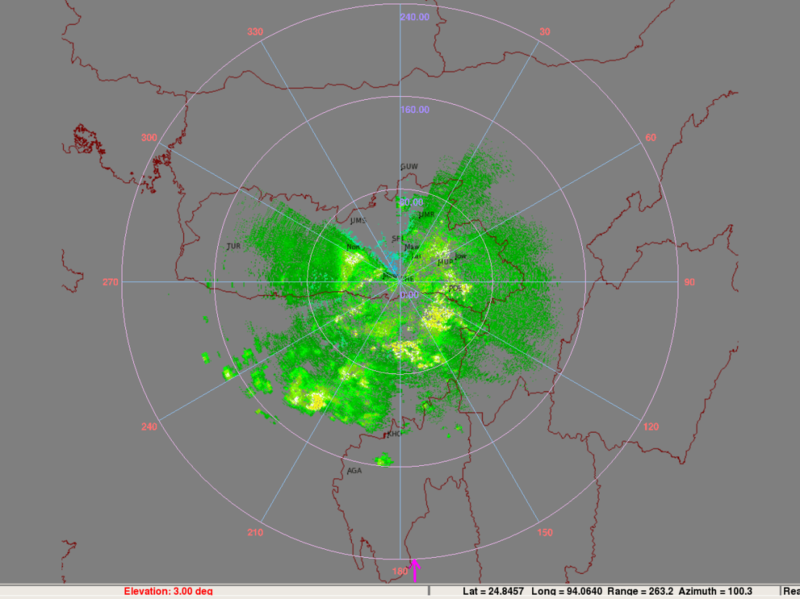 The use of the Cherrapunjee DWR data has improved the thunderstorm nowcasting accuracy over Meghalaya, Southern Assam, and Tripura states. Altogether 48 severe and very severe thunderstorms were forecasted in these three states during April 1 to June 15, 2017, period. The accuracy of nowcasting was more than 90% with lead time varying from 30 minutes to more than 2 hours. The nowcasting services were disseminated through NER-DRR website and also through direct communication to the concerned at the state level. 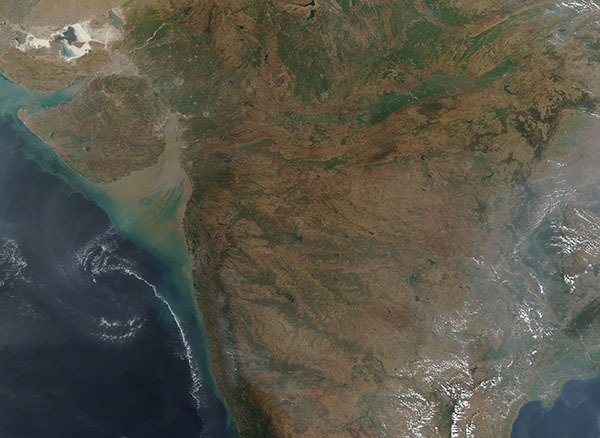 High-resolution optical imaging Earth Observation Satellite (EOS) systems such as CARTOSAT provide multi-spectral remote sensing data in the visible and near-infrared (VNIR) wavelengths of the order of sub-meter to few-meters. 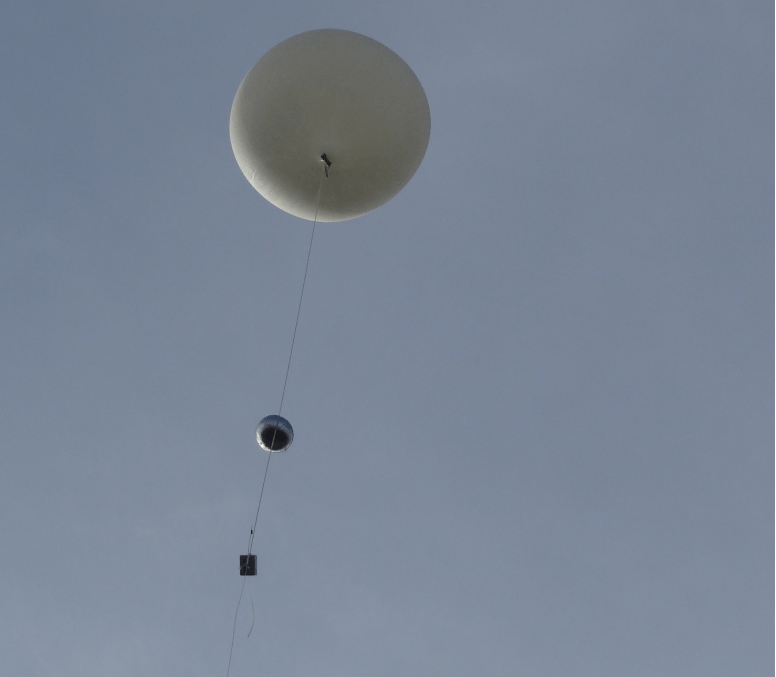 These datasets can be used in a variety of applications, particularly associated with precise mapping, monitoring and change detection of earth’s surface, if top of the atmosphere (TOA) measurements can be properly compensated for atmospheric absorption and scattering effects. Existing physics based atmospheric correction (AC) algorithms for multi/hyperspectral remote sensing data over land involves simultaneous use of visible and short-wave infrared (SWIR) channels to derive aerosol information. Hence, such algorithms cannot be used for AC of data acquired by VNIR sensors to derive “surface reflectance”. Towards this, Space Applications Centre, Ahmedabad has developed a new algorithm for AC of high-resolution VNIR remote sensing data in which aerosol information is retrieved from sensor measurements in VNIR channels and by selecting appropriate aerosol optical properties from a set of defined aerosol models. The algorithm uses lookup tables generated with vector radiative transfer calculations. Derived aerosol information and pre-computed lookup tables are employed to derive surface reflectance. 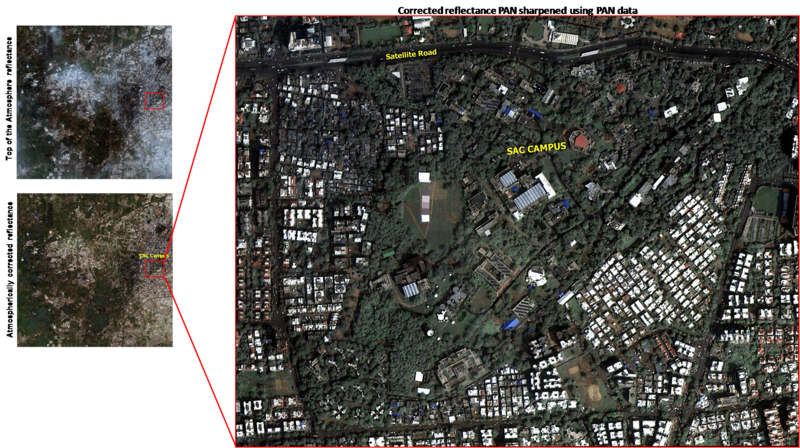 Good quality surface reflectances have been obtained when this algorithm was applied on Cartosat-2 Series Satellite data. It is found that this algorithm significantly removes the haze from the images, making surface features distinctly visible, and hence more useable for qualitative as well as quantitative analysis and further applications. Following figures illustrate the drastically improved quality of the images after applying the AC algorithms, where the contribution of light due to molecular scattering and scattering from thick layer of aerosol to the sensor measurement at the top the of the atmosphere is removed.